I would dearly love to post a song or two from the brilliant new (well, it's not new as such: it was recorded in 1992, but you know what I mean) Prefab Sprout record, Let’s Change The World With Music, but it’s not due out until early September and I know somebody would track me down and execute me with extreme prejudice if I did. He was, of course, charm personified. I told him that I saw Prefab Sprout in Bristol (on their last tour, way back in 2000) and that it was a fantastic night, far exceeding my expectations. He seemed quietly pleased, and my memory of the gig isn't soured at all by learning that he clearly didn't enjoy touring at all. He prefers to "potter." Don't we all. Look out for the interview somewhere down the line. And don't miss the album. Yes please Graeme...post the interview as soon as you can. I think without threat you can at least reveal the actual tracklisting. There are so many curious out there like to know. In terms of what it sounds like, I'd say it falls pretty neatly between 'Jordan' and 'Andromeda', which of course makes sense as these are the original recordings Paddy made (alone) of these songs, dating back to 1992: they have not been re-recorded, but have been "baked in the oven", as Paddy put it, by Calum Malcolm. It sounds finished, though. Definitely a proper, coherent and thematically unified album. The sound is pretty synthetic (not a lot of 'natural' band sounds, so probably closer to 'Andromeda' than 'Jordan') but the songs by and large are wonderful. I can't really post more of the interview because I have been commissioned to write it for a paper and a magazine. Sorry. Happy to try and answer any more questions, though. Thanks Graeme, much appreciated - I reviewed Complicated Shadows when it came out, thought it was great. 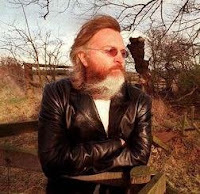 prefabsprout.net sent me to your blog and I have to give the good fellow credit on getting me here. Each day I find myself ever enthused at one of this year's most anticipated recordings for this here Yank. Anywaym Graeme, thank you for spending some time mentioning the work of one of the world's most underappreciated artists, Paddy McAloon. Anyway, apart from my love for science fiction, I'm a huge music fan and happy to have stumbled upon your site. I spent a fair bit of time living in Edinburgh and spending time in Scotland. A terrific people! I'll be back and as others mentioned previously, I hope we can see more of the interview here later or let us know where and when it is published and we'll try and hunt down a copy. Great track by the Waterboys as well. Lovely. Anonymous - thanks for your comments on Complicated Shadows. Glad you enjoyed it. Who did you review it for? And thank you too Sc-Fi Fanatic: lovely to have you around. You have no idea how excited I am by this news. Paddy is a blessed saint in my book and very much missed. It would be great of he could be persuaded to release some new recordings. Any news on the great man's health? I hope that he is doing well. Ps. I too really enjoyed Complicated Shadows...even if Elvis probably didn't! Thanks Darren. No, I don't think Elvis is a great fan of that book! Paddy seemed in relatively OK health: he said his eyes are still giving him problems, and he now has significant loss of hearing in one ear, but all in all he seemed pretty chipper. I am very, very excited. Paddy is my favourite alchemist. Complicated Shadows was reviewed for The Leeds Guide. I'm late coming to Prefab Sprout. I liked them a little bit back in the 80s and early 90s, but it wasn't until re-listening to some of their stuff about six months ago that I caught on to how much heart was in the songs -- the heart goes a thousand miles deep, in fact. Now I've acquired basically everything Paddy has done, and am hungry for more. It's a darned lucky thing that there's a new album coming out, and I can't wait to hear it. Hello, Graeme, from a long-time fan of Paddy & co. I look forward to reading your interview with the Sage of Durham County. I've enjoyed your EC book enormously. Any chance your next book -- or the one after that -- might be about Paddy Joe? Hi, one question only on the new album . There is a kind ofwendy smith voice in the let change the world of music songs ? Regular contributor to the Guardian, The Word, Uncut, New Statesman, the Herald and theartsdesk. My work has also appeared in the Observer, the Telegraph, Esquire, Mojo, Time Out, Rolling Stone, HMV Choice, Oxford American, the Sunday Business Post and Record Collector. Occasionally I’m allowed to break cover on Radio 2, Radio 4 and Radio Scotland. Author of five books: Complicated Shadows: The Life & Music of Elvis Costello (Canongate, 2004); Willie Nelson: The Outlaw (Virgin, 2006); I Shot a Man in Reno (Continuum, 2008); and Under the Ivy: The Life & Music of Kate Bush (Omnibus, 2010). I’ve just published The Resurrection of Johnny Cash (Jawbone, 2011). I’ve sat on a sofa in the control room of Abbey Road's Studio 2 and watched Paul McCartney remove his socks. Keith Richards phoned me at 4 a.m. to ask, 'Whatya doing up so late, old boy?'. I've been offered a potentially fatal Camberwell Carrot by Willie Nelson. I've made Bob Geldof cry into his meat loaf, and Elvis Costello once threw a peach stone in my general direction. He's even less friendly these days.